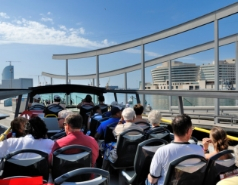 Barcelona City Tour boasts a fleet of 40 double-decker buses with a panoramic upper deck affording a unique view of the city. The lower deck is air-conditioned and all our vehicles are equipped with anatomical seats to make your trip more comfortable. Remember that our entire fleet is red in colour, indicating on the front which route is being covered at any given time. 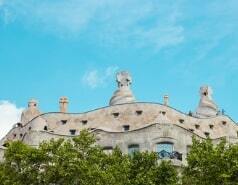 The Barcelona City Tour buses meet all EU emissions regulations. Our buses feature free Wi-Fi, so you can surf and keep yourself informed as you travel with us. All tickets include a set of standard headphones and a pre-recorded audio guide controlled by our on-board staff. 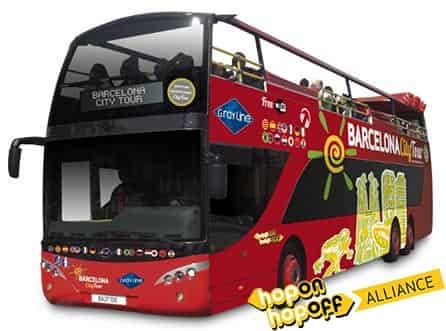 You will be given an information brochure when you get on one of Barcelona City Tour’s Hop-on Hop-off buses. Barcelona City Tour is an official Barcelona’s sightseeing tour, with a panoramic deck affording unique views over both the old and the new Barcelona. Using your ticket as often as you want over the course of either one or two (consecutive) days, you can hop on and off at any of the 35 stops along our two routes, which divide the city into Green/East and Orange/West. Plus, while onboard the Barcelona City Tour you'll receive a discount book that you can use in restaurants, stores, guided tours, transport and many other attractions. You can see all the discounts here. 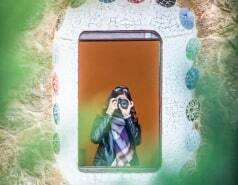 Discover Barcelona with your own custom itinerary. 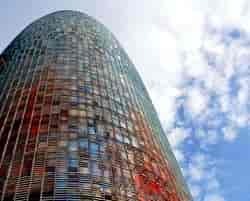 Barcelona City Tour makes it easy to get to know the city in a way that's different, comfortable and tailor made. Check out our map to see the various stops of the tourist bus and the points of interest. You can also download the free mobile app available for the Barcelona City Tour so you can have the information with you at all times. When you board the bus, you’ll be given a brochure with a plan of the city and details of the routes with a description of the stops. The brochure is available in up to 6 languages, depending upon availability: Catalan, Spanish, English, French, German and Italian.